New Owlet Smart Sock 2 Baby Heart Rate & Oxygen Level Monitor. Smart Sock 2 Features Sock sensor is flexible and designed to adapt to your baby’s foot as he or she grows. Updated fabric sock can be worn on either foot, allowing parents to alternate as needed. Owlet Cam Digital Video Monitor - White. Condition is New. Shipped with USPS Priority Mail. The back of the box does show a tear (see pictures) but the factory seal has never been taken off. 1st Generation Owlet Smart Sock Baby Monitor With 4 Socks. 1st Generation Owlet Smart Sock Baby Monitor With 4 Socks.. Condition is Used. Shipped with USPS Priority Mail. #1 left and right socks and #2 sock are I. Good Condition. Sock 3 has a small hole in it (ours we covered with a little duct tape - worked great). Socks are cheap to replace if you wanted to. Owlet 980110448 Smart Sock 2 Baby Monitor New Sealed . 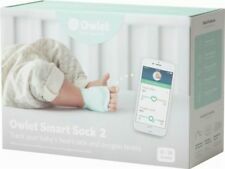 Owlet 980110448 Smart Sock 2 Baby Monitor. Condition is new sealed .Shipped with USPS Priority Mail. Owlet Baby Care -5 Smart Sock 3 are new, 2 Baby Monitor & 3 wireless alarts with cords an power block 1 not in the picture. Condition is Used. Shipped with USPS Priority Mail. Sealed! New Owlet Smart Sock 2 Baby Heart Rate & Oxygen Level Health Monitor. Condition is New. Shipped with USPS Priority Mail. Owlet Smart Sock with The base station glows green to let you know everything is okay but notifies with lights and sounds if heart rate or oxygen levels leave preset zones. Was used for exactly one week with a newborn. This information is communicated to your phone via a base station that is designed to notify you if your baby's heart rate or oxygen levels fall outside of preset zones. Owlet is intended to provide peace of mind. Owlet Baby Sock Monitor Green Set Charger Adapter Heart Rate Oxygen Sensor SIDS. Is in working used condition. Does show wear so please see pictures carefully before purchasing! Includes size 3 sock (4-18 months). Smoke free home. Shipped with USPS Priority Mail. HEAR & SEE YOUR BABY FROM ANYWHERE: Transform your phone into a smart baby monitor with the ability to stream video and sound from wherever you are via the Owlet App. Owlet App available in iOS and Android. Condition is New. Access to the Owlet app. Hypoallergenic cotton sock. 100' sock to base station range. Works on any device running iOS 8 or higher and Android devices running Android 4.4. Features Free Connected Care app to view sleep trends and analytics and historical heart rate and oxygen levels. Owlet Cam. Condition is New. Shipped with USPS Priority Mail. Ensure your child's safety with this Owlet baby monitor. The 130-degree lens and night vision technology provide expansive, round-the-clock views in HD quality, and the background audio lets you listen in while multitasking on your phone. This is a used item. It works well, it was used for about 6 months. It has a set of 3 green socks and a set of 3 blue socks. *BRAND NEW* Owlet Smart Sock 2 Baby Monitor - Retail $299.99. Condition is New. Shipped with USPS Priority Mail. Never opened or used. Original packaging. Not shrink wrapped though. Everything is in excellent condition. Great piece of mind! Everything pictured included. Owlet Smart Sock 2 Baby Heart Rate & Oxygen Level Health Monitor NEW in BOX!! Smart Sock 2 Features Sock sensor is flexible and designed to adapt to your baby’s foot as he or she grows. Updated fabric sock can be worn on either foot, allowing parents to alternate as needed. Used only once. Great for monitoring your baby. It works great, I just didn’t feel the need to use it. Owlet Smart Sock 2 Baby Monitor w/ Charging Cord-Warranty Included The Owlet Smart Sock 2 tracks heart rate and oxygen levels using clinically-proven technology Base station collects smart sock data and is designed to notify you with lights and sounds if something appears to be wrong Using Owlet's app, see real-time wellness data and receive notifications Owlet is not a medical device and is not intended to diagnose, treat, mitigate, cure, or prevent any disease or condition Includes: 3 fabric socks with universal fit - sizes 1-3 (up to 18 months) Smart Sock Sensor (Pulse Oximeter w/ Bluetooth technology) Base station Charging Cords Access to the Owlet app Works on any device running iOS 8 or higher and Android devices running Android 4. Box has been opened. But everything is sealed and new. Owlet baby monitor, new in box. Owlet baby monitor 2. pretty much new got 5 months ago, used a handful of times. Comes with pink and mint socks. The pink socks will need clean. The mint socks were never used. Comes with sizes 1, 2, and 3 in both colors. Comes with all original wires and manual. Works great. Owlet Smart Sock Brand New In Box. Condition is New. Shipped with USPS Priority Mail. Owlet Smart Sock 2 Baby Monitor. Condition is New. Shipped with USPS Priority Mail. Brand new. Has 3 different size socks. Comes with everything in picture. Can set up on mobile device to check heart rate and oxygen levels. Will also alert phone when a drop in heart or oxygen. Can be custom set. 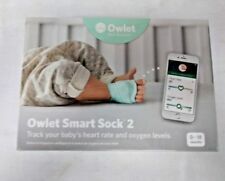 Owlet 980110448 Smart Sock 2 Baby Monitor Brand New!!!!!! Access to the Owlet app. Hypoallergenic cotton sock. 100' sock to base station range. Model BM03NNBBYC. Works on any device running iOS 8 or higher and Android devices running Android 4.4. skuId : 46938244. Owlet Smart Sock 2- Track your baby's heart rate and oxygen levels - EUC. We used this during our baby's infancy and it gave us such peace of mind! The sensor went out so we contacted the company and they sent us a new sensor, and it has NEVER BEEN USED. It's basically a brand new Owlet now. The three socks have been washed and are ready to use, but can be purchased elsewhere if you want new ones. The base station is/was dirty on the bottom even though it just sat in one place while we used it. I cleaned it the best I could. Doesn't affect how it works.